Hon. 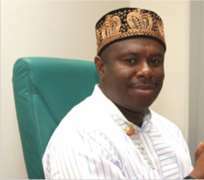 Dakuku Peterside, Chairman, House of Representatives Committee on Petroleum Resources (Downstream) and representative, Andoni/Opobo-Nkoro Federal Constituency has described Rt. Hon. Chibuike Rotimi Amaechi who yesterday received award by Business Day for States' Competitiveness and Good Governance as a man of uncommon courage and character. Petersidewho attended the colourful award ceremony which held in Lagos commended Business Day for selecting Amaechi and for showing rare bravery in their choice especially in this season when any act of courage is easily misunderstood. According to Peterside, “we are not surprised that he was selected for this award. For a man who has dedicated his entire life to the service of his people, this award is not only fitting but encouraging. We are therefore happy that his achievements resonate beyond our state”. Continuing, Peterside added: “Governor Amaechi will continue to disappoint his detractors because of the strength of his character, courage and focus. And for his teeming admirers, we are optimistic and confident that he will end well because he is already leaving lasting legacies in Rivers State. Award by Business Day for States' Competitiveness and Good Governance is part of that celebration that is already echoing beyond Rivers State. It will be recalled that Business Day gave out the award in 13 categories and Rivers State won in a number of categories. Governor Chibuike Amaechi of Rivers State carted away the Best Governor in Education Development award. The lawmaker therefore prayed God to grant Nigeria more individuals in the mould of Amaechi. “Nigeria needs more Rotimi Amaechis to speak truth and courage whenever the need arises. That is the only way to build our nation and escape God's judgement”.